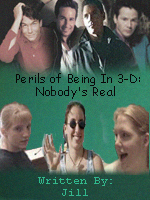 Summary: Continuation of "Perils of Being In 3-D: Take Me Anywhere"... or is it? Disclaimer: Mulder, Krycek, Marita, and The Cigarette-Smoking Man belong to Chris Carter, Ten-Thirteen Productions and 20th Century FOX. Jerry O'Connell, Keanu Reeves, David Duchovny, and Nick Lea own themselves. Jill, Cassie and Kristi are the producers of "Fox & Rat" Virtual Series... nuff said. Archive: This story is meant for the "Fox & Rat" Virtual Series, please e-mail the Producers of FRVS for permission to archive this story on your site. Thank you. We see the back bumper of MULDER and KRYCEK's rental car in Cape May, New Jersey. Everything is totally silent, until the car suddenly takes off with a loud screech. Out of nowhere, "tourette's" by Nirvana starts to play. Camera takes POV of inside the car. KRYCEK is holding on for dear life, while MULDER looks like a little boy in an arcade. MULDER~ Woohoo, yeah! I haven't done this since high school! He takes both hands off the steering wheel, turning to a horrified KRYCEK. KRYCEK~ (grabbing the steering wheel instantly, yelling) What school did you go to?! This is not happening! All of a sudden, the scene of an out of control car racing dangerously, and its two occupants freezes. The song abruptly stops, as the scene fades to black and white. A man slowly walks onto the street in front of the car, but we only see his dress suit and cigarette in hand. The camera soon reveals the face of the CIGARETTE SMOKING MAN. Camera zooms in to the CSM's face, as he takes a drag from his cigarette. CSM~ The Parapsychologist Meets More Serious Russian Man Zone! The camera now pulls back to reveal a seemingly average Hollywood sound stage. The CSM drops his cigarette, rolling his eyes, while the MAN (the director) approaches him. The screen showing MULDER and KRYCEK's car chase fades to black. DIRECTOR~ (irate) Damn it, Bill! You know I wanted to get Keanu Reeves to do this part! WILLIAM B. DAVIS~ (sighing) You know what I think of this plotline! DIRECTOR~ (frustrated) Break! We'll start again in 15 minutes! BILL DAVIS sulks away, along with the DIRECTOR, only they're walking in opposite directions. The camera focuses on a hallway in the corner, as MULDER and KRYCEK walk through it, amazed. MULDER~ (disappointed) Where's the car? I wanted to go on an adventure! KRYCEK~ (relieved) Who cares?! We're alive, no thanks to you! The two argue more loudly, bumping into a man with his back turned away from them, as they reach the end of the hallway. The man turns around, revealing his identity. KEANU REEVES~ (looking attractive :-) Oh, David, Nic....So glad to run into you. MULDER and KRYCEK exchange an overjoyed glance. MULDER~ *Oh my God*!!! Duuuude!!! KRYCEK~ Shane Falco?! In person?! No freaking way!!! KEANU gives them both an odd look. KEANU~ (scared) I'm going over, um....to talk with Jerry. MULDER~ (shrugs) What did we do? KRYCEK~ (shaking head) Beats me....I'm going to look for the writers. KRYCEK~ (rolling eyes, sarcastically) *Yeah*....how else will I know what's going to happen to our characters next episode?! KRYCEK takes off back down the hall. Camera focuses on a dumbfounded MULDER, who runs after KRYCEK after a moment. We see KRYCEK's back as he bangs on a door with a large gold star on it. A blonde girl, who looks about 20, answers the door. CASSIE~ Nic, what is it now? Is Jerry bothering you again? KRYCEK~ (sighs) Noooo, David is.... (he begins to whisper) He thinks he is "MULDER". Two other girls, one a blonde, the other a brunette, both about 17, join CASSIE at the door. JILL~ (the brunette) I must have fallen asleep while typing the script again, Kristi. KRYCEK~ (irritated) I'll just try to stay away from him while you figure something out, okay?! KRYCEK storms off down the hall, leaving the girls confused. CASSIE closes the door, and we see inside of their office. A huge "Fox and Rat: The Series" banner is painted on the wall facing the door. JILL~ (nervous) Let's not panic. KRISTI~ (terrified) How can we not?! CASSIE~ (sighing) I'm getting David. The camera follows her out the door, back into the hall leading to the set. MULDER is peeking in dressing room doors. We hear a man's scream coming from inside one of the doors. MULDER runs to CASSIE, like a scared baby squirrel. She drags MULDER back into her office. As we enter, JILL and KRISTI are pacing around nervously. CASSIE pushes MULDER onto a bean bag chair in the corner. MULDER~ (frightened) Don't eat me! JILL~ (sighing) I screwed up while working on this script. She hands MULDER a pile of papers. MULDER flips through them. MULDER~ (blown away) This is what just happened to me and Alex in the car! KRISTI~ Nooo, we *wrote* that....Your name is David Duchovny. MULDER~ (interrupting) No, FOX MULDER, Special Agent! The girls exchange horrified looks. CASSIE~ (brave) Okay, it's time for Plan B.
KRISTI~ (solemn) I'll get it. MULDER~ (desparate) Please, I just want to go home! JILL looks away, as KRISTI emerges with a large photo facing her. KRISTI~ (cautious) Um, David....look at *this*! She quickly flips the photo around to face MULDER, putting a hand over her eyes. In the background, CASSIE and JILL duck and cover. KRISTI~ (disgusted) This is a naked photo of your *wife*, Tea Leoni! We never see the photo, only the back of MULDER's head. MULDER~ (as if he had just seen the Blair Witch) Noooooo!!! That goes against all laws of human nature!!! His shrieks echo, as we FADE OUT. We see an extreme close up of MULDER's face, as his eyelids flutter open. He is in KRYCEK's bed. KRYCEK is sitting on the bed with MARITA. MARITA~ (calmly) Fox....last night, we all ate at McDonald's....remember that? MULDER shakes his head no, appearing feverish. KRYCEK~ (slowly) You ordered five Chicken Fajitas. We warned you not to eat any, but you ate them all! MARITA~ (holding MULDER's hand) You became delirious shortly after, so we brought you home. You kept mumbling things about Krycek's past and his fear of New Jersey. KRYCEK~ (laughing) Yeah....How did you know I lived there, and I really *was* lost in the woods?! KRYCEK~ (pushing MULDER gently down) Whatever....Marita and I are going to the movies....to see "Fox and Rat's Winter Vacation"! MARITA~ (laughing) Yeah! From the previews, it seems like the main characters could be us! KRYCEK also starts to chuckle, as they leave. Once they are gone, MULDER gets out of bed. The camera follows him to the window. MULDER~ (spooked, quietly) Wow....I guess nobody's real.